It is always great to catch up with Tacori, one of the most popular and recognized brand of engagement rings and wedding bands. We can’t wait to see the new collections and pieces during Vegas Jewelry Week. The busy Tacori team was kind enough to answer some of our questions ahead of their new launches. When I visited the Tacori booth last Jewelry Week in Vegas, I loved the California Living vibe. How would you say both your European heritage and the fact that that you are based in LA influence your collections? Tacori’s fashion collections are inspired by the effortless timelessness of California style, that is also infused with the legacy of the Tacorian family’s European heritage – subtle, yet intricate details, which sets a Tacori design apart from every other. The difference is in the details. 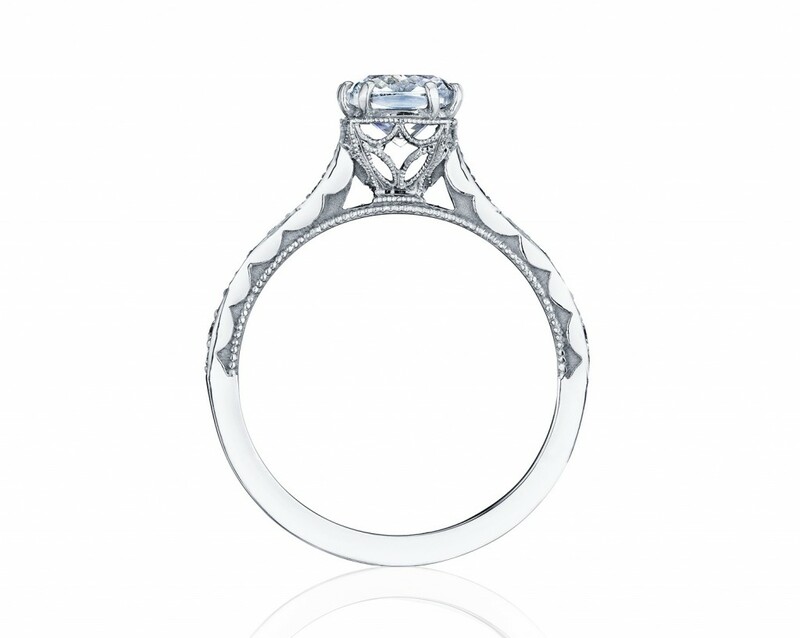 Tacori engagement rings look amazing from every angle but it’s the sides that always stop me in my tracks. 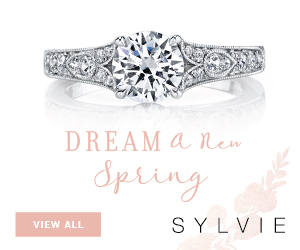 Tell us about your signature crescent silhouette/design element and why it works with so many diamond shapes and settings? 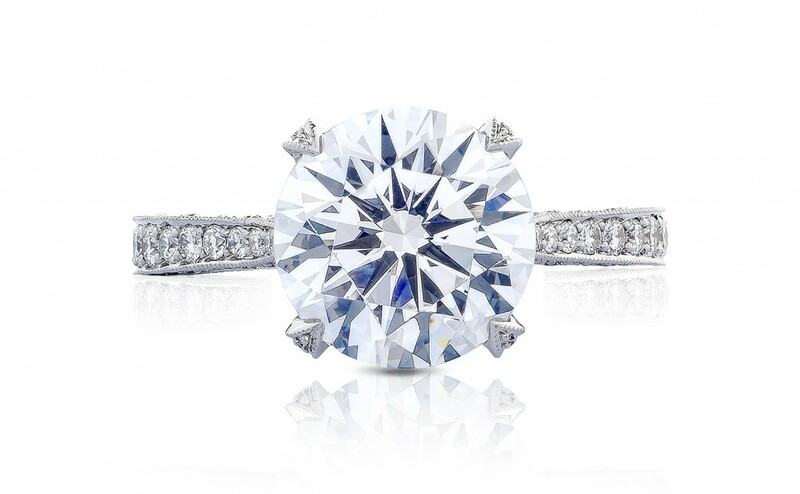 The iconic Tacori crescent silhouette is a proprietary design element that is ingrained within every Tacori design that sets it apart from all the rest – by allowing windows of light to shine your center diamond to its maximum brilliance. Tacori’s crescent silhouette is not only a detail within Tacori design but is a significant design element that truly shows beauty from every angle. 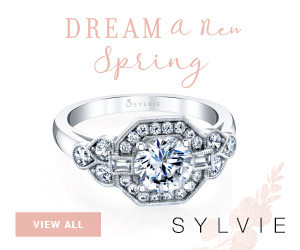 Our Clean Crescent design has re-imagined the signature Tacori crescent pattern on the innerface of the ring into a smaller, streamlined crescent detailing with a more diamond intense look. This Clean Crescent Collection shines brilliantly, while still giving a nod to the heritage of the unique Tacori touch. The Royal T collection also offers amazing side views, especially in platinum and in the 3-stone designs featured below. Why do you like offering rings in platinum and what is the advantage of picking this metal over white gold? To start, Platinum’s naturally white color won’t fade or change color over time. 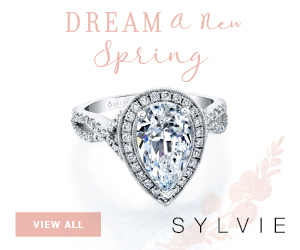 This means, no maintenance is required to maintain a white hue over the lifetime of the ring. Compared to a white gold ring, it’s important to note that gold itself is naturally occurring as a soft yellow metal. In order to change the color from yellow gold to white gold, the natural yellow gold must be mixed with other white metals – also known as an “alloy” – to lessen the yellow . The initial white color of a new white gold ring will fade over time, and requires maintenance over the life of the ring to restore the white color to a showroom finish. 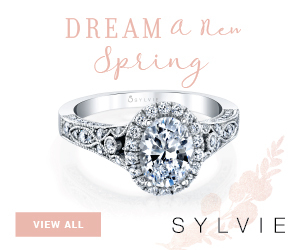 This is different from a platinum ring, which will not require maintenance to maintain its natural white hue. Additionally, the metal purity of platinum is approximately 95% pure Platinum, compared to a white gold alloy, which is approximately 75% gold for an 18K gold alloy ring. 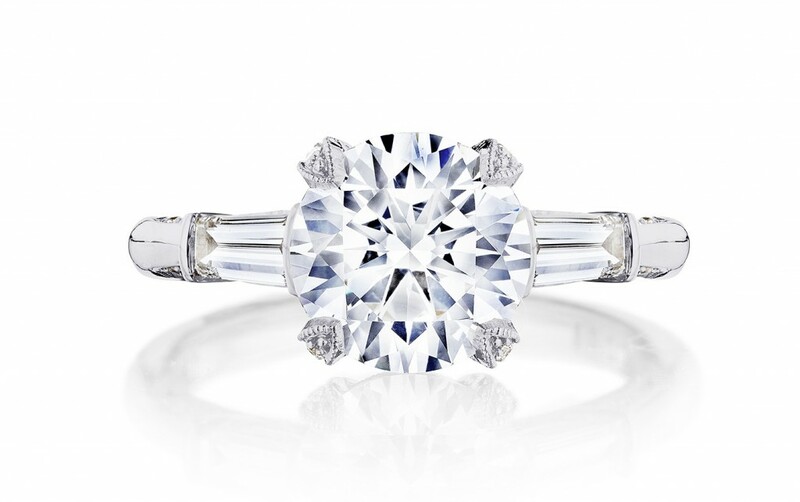 This purity makes a platinum ring not only more dense with this precious metal (as it’s 95% pure Platinum), but it is also naturally hypoallergenic and ideal for those with sensitive skin. This is different from white gold, which is known to contain other metals in its alloy which may trigger an allergic reaction. Additionally, this natural density and weight of platinum – as platinum is 40% heavier than gold – are characteristics that make it more durable than other jewelry metals. Platinum does not wear away and holds precious stones firmly and securely. 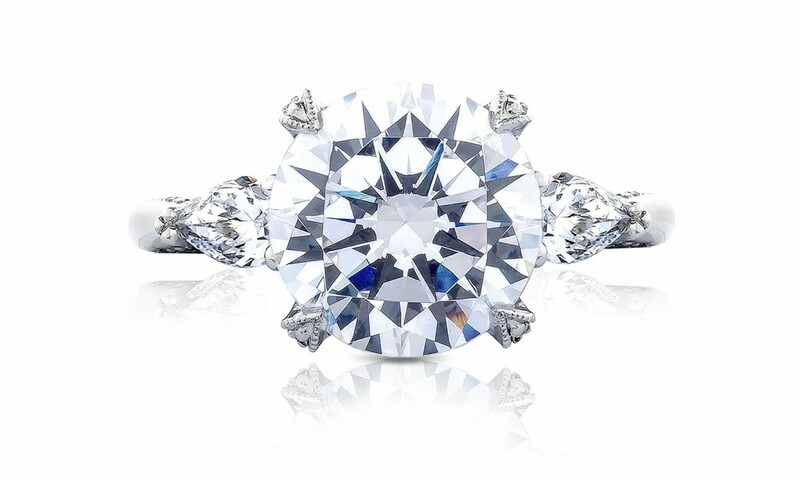 In short, platinum prongs are better protection for diamonds. Like all precious metals, platinum scratches. But when these scratches occur on a platinum piece, the metal is merely displaced rather than lost and they actually create a natural, rich patina on the ring that symbolizes the ring’s journey. In our opinion, everything looks better in platinum. You offer an amazing promotion when couples purchase a Platinum Tacori engagement ring. Tell us what it is and how it works? Yes, it is part of our Tacori Journeys Program, a program that ties the promise of travel and adventure to the jewelry-buying experience. The Tacori Journeys travel voucher is a membership exclusive that can be used towards savings on destinations around the world. The Tacori Journeys travel voucher awards you membership points that allow you to deduct savings from your points balance to arrive at the lowest available discount rate. For any platinum purchase, the travel voucher is $2500 going up to $5,000 for a RoyalT in platinum. 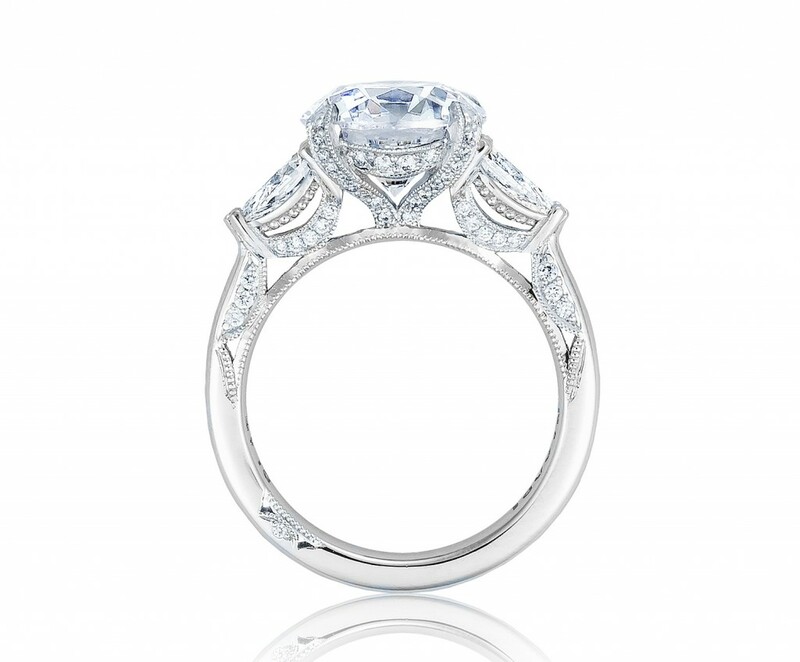 For more information and to browse all Tacori engagement rings click here.